– Widget showing the appointments next 7 days. – Possibility to add an appointment directly from Calendar Pad, so the default Android Calendar can be avoided. Great app, but why does it require internet access? You could argue that giving an application access to both reading your calendar and accessing the internet may raise some privacy concerns. Hello, Great app! But would it be possible to have a widget that would list the upcoming events only on half a screen (like 4 columns by 2 rows)? Thanks a lot!!! Hi, i was wondering will you be possible to add in the ability to change to color of the events describe font, i notice that is default red and you can’t change the color. Hi – like the design! Is incorporation of the corporate calendar planned? Hi, have a feature request (perhaps for the paid versions only). Can you add the ability to quickly display or hide different calendars. 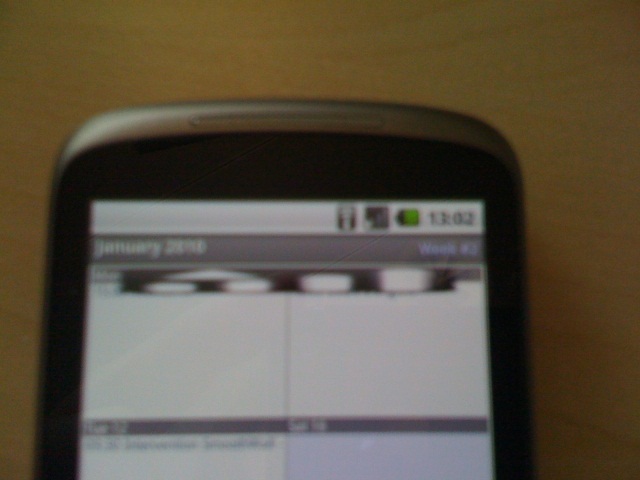 Major bug: Using HTC Hero (OS 2.1) with HTC Sense UI overlay. Using Calendar Pad day view, when I open an ALL DAY event, Calendar Pad changes the date back by one day. EG, all day appointment on Sunday, open it with Calendar Pad and it changes to Monday. Open it again and it changes to Tuesday. Can you please test this – I have reported this twice via email through the Market and have recieved no reply whatsoever which is very poor communications from the developer. Sorry – NOT HTC Hero. HTC Desire! 1. Make it possible to choose “discontinued days” as repeating events; i.e. Monday, Tuesday, Friday Sunday = make your own pick. 3. Make it possible to put an end date to a repeating event. 4. Make it possible to “strikethrough” an event without deleting it. What are the advanced calendar features offered by the Pro version of Calendar Pad, other than the color customization? Hi, I bought Calendar Pad Pro – great App. Is it possible, to reduce the number of the widgets in the widgets list? How about an English language version of website? Can we have the facility to change colours by entering a number, not just using the slides. Its not very easy getting the exact colour you want. Eg. I wanted the weekends to be the same colour. I’d like floating events. Which means, that the event automatically advances to the next day if not tagged as “done”. A kind of mini-to-do-application. The description can be used to add hidden information about the status. The popular DateBk for Palm does it this way. Please add a 4×2 widget view for the week. Or a 4×2 agenda view widget. Please please please. Hi can you make this app have the ability to scroll through the months in the widget? Also, when you click on the even in the day on the widget can the program take you to the event manager in google and not the calendar in the app? Can’t add an appointment !!!! Crashes. I love your Calendar Pad app and will purchase the Pro version shortly. One feature I would love to see added would be a “MOVE” function when you long hold on an appointment. The MOVE function will let you move an appointment from the current calendar to another calendar. I would like this because half the time I forget to check which calendar I put the appointment on and I end up having to delete the appointment and reenter it again in the correct calendar. This is a brilliant app. I would buy the pro-version, if Google would let me. One feature I would like, is to select which calendars should be be displayed, and which to ignore. First of all great app, keep up this way. I would like to report a problem on the Xperia Mini 10 Pro : it’s impossible to add a new event. Do not hesitate to contact me if you want more information or if you want me to do some testing on a new fixed version. I am one of your enthusiastic user. I am very satisfied with the product. I have just downloaded the pro version from the market hoping that it contains the option that the location of the appointment can be displayed in the day view in the day widgets and the application as well. Is that possible to add this feature in the next release? Google order number 975551747737196 for Calender Pro was a failed download. Can you upload it again? Usually, the downloading’s problem seems a temporary problem of the Android Market. I think it will be settled in several hours. If you cannot get it after time passed, please contact Google to get a support with accessing the following URL. I’ve solved this with a week calender in google but it would be neat! Upgraded to Pro version yesterday. Now the widget (4×4 week calendar) does not update/refresh properly. When I remove and add the widget, it shows the contents of the calendar, but after a while it does not anymore; it shows an empty week. When I touch the widget, the week calendar opens. The opened calendar shows all contents. When I close the calendar (back button), the widget still does not show any items. Phone: HTC Legend, android 2.1. Hi! I love Calendar Pad Pro, it suits my needs perfectly! Suggestion though: Is it possible to have an additional setting to change the colour of the “appointment” text? (I use transparent background on my day widget). Currently it’s only black text which makes it hard to read on anything else than light backgrounds. Oh, and another suggestion; is it possible to have the month widget touch sensitive to each day? If yes I would be excited to see the option to make DAY the default view! (press selected day on month widget -> open selected day view. Instead of now press month widget -> open Calendar Pad Pro month wiew -> press day -> open day view. Same problem as also listed below. Appointments shift over one day after restart. Makes this app completely useless. Great app. and support. The single greatest feature is the ability to see the event name in month view. My wish list: add the Palm-like ability to create a “Call” event which allows for a one touch link with a name from “Contacts” (This is a “Link” in the Palm OS). Could app developers ever collaborate? I would love to see integration between my three productivity apps: Calendar Pad Pro, Astrid and COL Reminder (and then have Google pay you lots of money to integrate it all into Android). A really nice calendar frontend. Thanks for all the work! One thing which puzzles me however (with all android calendar apps) is the following: Pretty much all events fall into 3 categories: A) a task, B) a meeting/appointment, and C) a phone call. For the latter 2 cases, most of the people we talk to or meet, we have met before, and thus, they are likely that they already exist in our contacts lists. E.g., if I schedule an appointment with my dentist, I have to tediously type in “Dentist”. If I happen to be late I have to look up his number and call him. Consider how much more elegant it would be to select new event -> From contacts, and tap the entry for the dentist, eh voila, his name, and address details would be in my calendar. No typing required, and all the data where you need it. The only app which does this to a certain extent is the gemini calendar, but it is cumbersome to use. Having the ability to directly insert information from the contacs lists, or the call log, would be a real killer feature for me (and I would be happy to pay for). Can i suggest to implement the “other calendars” as an option to be displayed in calendar pad? This app is very nice btw, great work! Great app. Slim and to the point. No problems so far. One point. In every view there should be a possiblity to jump to a specific date (or week or month depending on the view) via the options menu, at least in month view. At present you have to wipe and wipe and … in order to check the dates months ahead.